Thiruvanthapuram, 23 Jan - A fortnight after the NBA India conducted a day-long training session at the Rajeev Gandhi Indoor Stadium for sports teachers of the region, a mini basketball skills challenge for kids of U-12 ,U14 and U16 age groups were conducted by Jr NBA Skill challenge in association with Reliance Foundation at Sports Hub, Trivandrum. More than 2000 kids from over 120 schools participated in the skill challenge that happened across three centers from Thiruvanthapuram ,Kottayam and Kozhikode . The last of which conducted at Sports Hub, Trivandrum on Monday saw the largest participation with 762 kids attending the skill challenge. The first skill challenge was held on 16th January at Kozhikode and second one at S F S School Ground in Ettumanoor. The skill challenges were lead by Sara Gayler, coach from USA , and Carla Paloma from Spain, who are now assigned with NBA in India. Sara explained what the kids have to do in the five specially designed tasks for the workouts. “All the participants were made to go through the five challenges to test their skills on the footwork, lay-up, passing, dribbling and hotshot stations. The kids enjoyed dribbling, weaving through cones, and shooting at the basket for points .The event was a fun and a competitive way for children to see how well their basketball skills are developing,” Sara said. After a player clears all the five skill sections they were given the participation certificate. Moreover, depending on overall performance, 24 players were selected from each center who were awarded with merit certificate and NBA T- shirts .The program was free of cost. 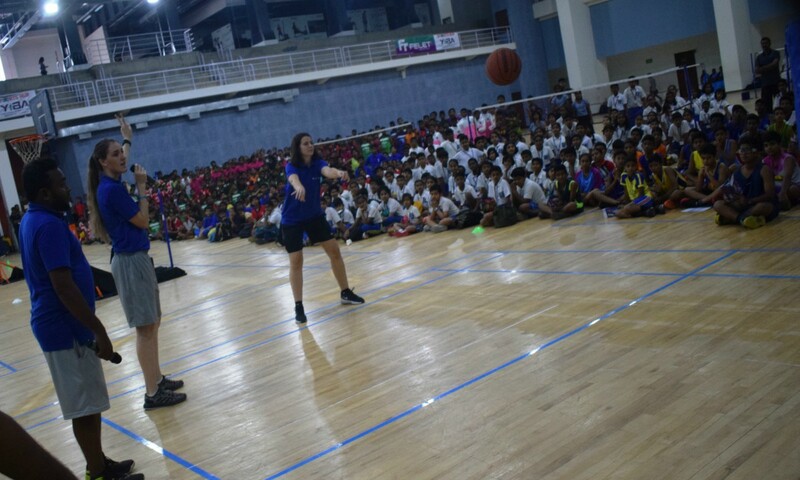 While explaining the details about the event, Sarah told the kids and coaches about the NBA India initiative. “The Jr NBA is focused on helping grow and improve the youth basketball experience for players, coaches and parents,” she said. Carlo Paloma, who was on her first visit to Kerala was excited over the enthusiasm and skill set shown by the participants. As the NBA’s efforts continue to expand in India, and the first pre season NBA games is set to be played in India in October, the association’s maiden initiative was welcomed with high spirits by the Kerala basketball fraternity.